in the form of a sale! Etsy doesn't have a way to discount an order at checkout. the 20% DISCOUNT within 24 Hours.....Promise! Our family lives in Chattanooga, TN. Chattanooga is at the bottom of the state and borders with Georgia. We are considered "in the South" but not far enough to miss a snow dusting from time to time. Our entire city will close down for even a "threat" of snow or ice! Two weeks ago we had our first snow. We normally have one or two dustings of snow, but usually not enough to sled in. Well....as you see by the photo of my family....sledding was in order! Yesterday it happened again....another snow....out of the blue! We love it! I know that some of you in the USA don't have the same sentiments for snow. I have a good friend that lives in Maryland. I think snow is definately a "FOUR LETTER WORD" for him right now! I decided that we need to be reminded that Spring and Summer are on their way! I've listed four great patterns ready for "Fun in the Sun"! Time to get back to business! Have you ever felt like you were asleep for a long time to wake up and find that you have missed life for the past year? This is how I feel. I have been "BUSY" doing life but not busy working on building my business. Well.....things are "changing"! I am ready to build my vintage pattern business. I have a new goal of listing 50 new patterns every week. Check back often to see if I'm able to do this! My business needs to grow and I know that if God wants it to grow, and I'm putting my best forward, it will happen. 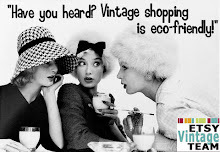 Big Vintage Sewing Pattern SALE! 20% OFF EVERY PATTERN until the end of APRIL 2009! until the end of APRIL! Get your wardrobe ready for summer now! Great Video's For Beginner Sewing - "How To" Video's on Purchasing, Reading, Cutting Out and Pinning a Pattern! I recently came across several videos on YouTube regarding several different topics on buying, reading and understanding patterns. The information is great for someone new to sewing or to even a veteran seamstress that just wasn't sure what all the different markings on the pattern were really all about! The videos cover topics such as: How to read a pattern, How to understand which body type the pattern will fit best, How to cut out the pattern, How to know how much material and what type of material you should buy for your pattern, How to layout and pin the pattern to your material and more! You can find the videos on my website, sassybydesign.com, listed on my articles page or you can follow this link ! Enjoy Sewing! This close-fitting, lined, boned top has princess seams, dropped waist, contrast piping/loops with button trim, shaped front and back separating zipper. View A has contrast shoulder straps. The lined, flared skirt is floor length and has a waistband and a back zipper/pleats. This isn't a vintage pattern but I couldn't resist adding it in ! I love the fitted bodice and the super full skirt! I think this dress would make any girl look like a princess! 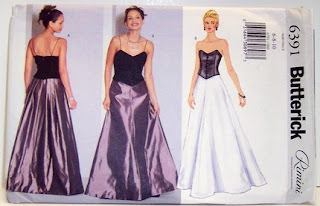 This "ball gown" type of pattern works well with any figure and even helps conceal problem hip and leg areas. A prom dress is both an important decision and can be a very costly one as well. I recently came across an article that listed some great reasons to sew your own dress! One, very big reason, is the cost. The article states that an average prom dress can cost up to $ 500.00! The article then states that the cost of sewing your own dress normally runs about $ 50.00! Well, we know that this amount can vary depending on the type of material and trims that you may use but the savings will still be worth it in the end! Just think....more money to spend on all the finishing touches like....hair, nails, jewelry and don't forget....awesome shoes!